Set of Four: $2,995.00. 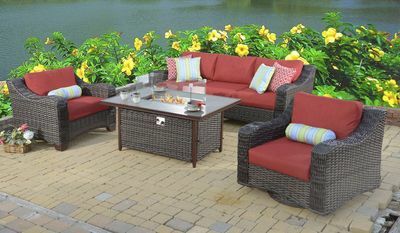 This elegant "All Weather" set is ideal for outdoor entertaining on your deck or patio. Each piece is handwoven over rustproof aluminum frames using a soft durable vinyl/resin material in a flat weave. The plush cushions and wide arms of this set invites you to sit back and relax. Enjoy a cozy atmosphere with the enclosed fire pit table. Cushions included in your choice of indoor/outdoor fabric. Sunbrella fabrics available for an additional charge. Available in an Two Tone Brown finish.